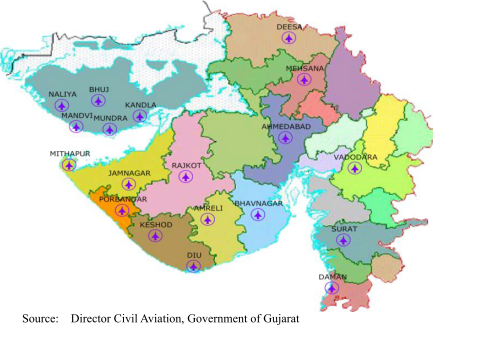 There are 19 airports in Gujarat State, wherein the Dholera green-field airport is to be constructed. Of these airports, nine (in Ahmedabad,Vadodara, Bhavnagar, Rajkot, Deesa, Surat, Kandla, Porbandar, and Keshod) are managed by the Airports Authority of India (AAI); however, the two airports in Deesa and Porbandar are not operational. In addition, the India Air Force (IAF) manages Bhuj, Nalia, Jamnagar airports, and the Gujarat State government manages Mehsana, Amreli, and Mandvi airports. A private company manages Mithapur (Tata), Mundra (Adani), Diu, and Daman airports.